I've held off posting more about Lauren de Laurence, as I assumed that others were probably getting tired of hearing about my personal favorite local dubious historical publisher. After some positive feedback, I'm giving in and posting a few things that I've come across. Firstly, Michael Nowicki has posted several images from de Laurence's catalogs, along with an amusing story on Rosicrucians.org. According to Nowicki, the de Laurence company was still in business in the 1960s (despite the fact that de Laurence himself died in 1936). Rather than post his story here, I'm just going to suggest that you visit the website to read his anecdote about visiting the de Laurence company. A Tarot website at http://home.comcast.net/~vilex includes many images regarding the de Laurence Company's Tarot deck (a blatant copy of the Ryder-Waite deck). The author goes into great detail regarding different printings of de Laurence's deck and related books. "The Key to the Tarot: Oracles Behind the Veil, by Dr. L.W. de Laurence. It is, or should be, common knowledge that this book is AE Waite's Pictorial Key to the Tarot word for word!" Website Church of Good Luck includes scans of de Laurence's catalogs. Follow the link to see several advertisements. "Artist's Conception of de Laurence Wearing a Turban and a Tunic"
"De Laurence wrote a lot of his own material in addition to his habit of "borrowing", and what he wrote best was ad copy. He managed to fill over 500 pages in his 1931 catalog, and it stands to this day as a monument to bombast." And so that I am able to contribute something of my own, here is a snapshot of the back page of an issue of Occult Digest from 1933 (three years before de Laurence would pass away). 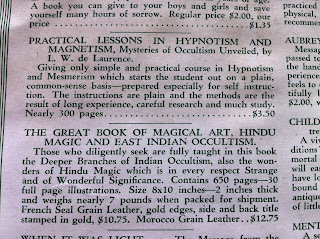 Included are ads for Practical Lessons in Hypnotism and Magnetism, and The Great Book of Magical Art, Hindu Magic and East Indian Occultism. 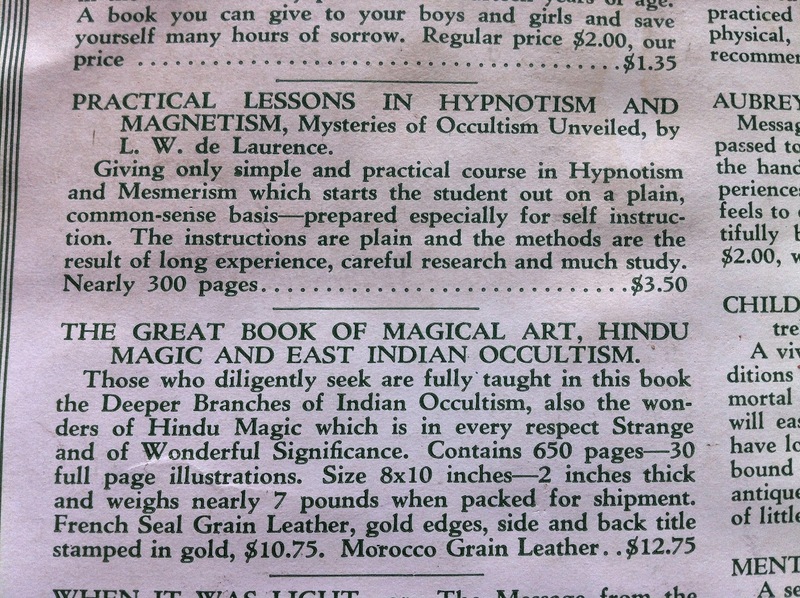 The latter, you may recall, was found in a local bookstore (with alternate "Hindoo" spelling).